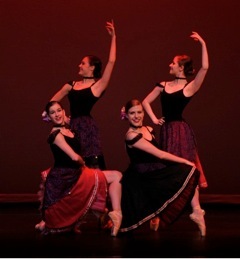 The High School for Performing and Visual Arts (HSPVA) Dance Department presents the Concert Dancers in the HSPVA SPRING DANCE CONCERT Thursday, MARCH 6th, 7:00 p.m. and Friday, MARCH 7th, 7:00 p.m. The concert will feature contemporary ballet, jazz and modern dance choreography by the HSPVA dance faculty, also featured will be guest choreographic works by Jennifer Golonka, founder of the Luminary Dance Project, Pattie Obey, International Jazz Dance choreographer and a section of José Limón’s work Psalm, restaged by Ms. Nina Watt former thirty-year veteran of the José Limón Dance Company. DATE: Thursday, MARCH 6th, 2014 at 7:00 p.m.
Friday, MARCH 7th, 2014 at 7:00 p.m.
TICKETS: Reserved $15, General Admission $10.